Cook with what you have sounds nice but what should/would you like to have on hand? This is a fun and complex question. I’m going to tackle a small fragment of this question today. I’m going to talk about beans, white beans, and cooking them at home. A quick side note about dry beans. Here in the Portland area we are lucky to have a couple of very local sources of dried beans. Ayers Creek Farm sells their beans at the Hillsdale Farmers Market. The quality, flavor, varieties are unbeatable and worth seeking out. Sungold Farm sells pinto beans that are wonderfully sweat and creamy and are available at both the Portland Farmers Market and the Hillsdale Farmers Market. I have also had very good results with dry beans purchased from grocery stores, both bulk and packaged, so don’t let the possible lack of local beans deter you. I love to cook beans. 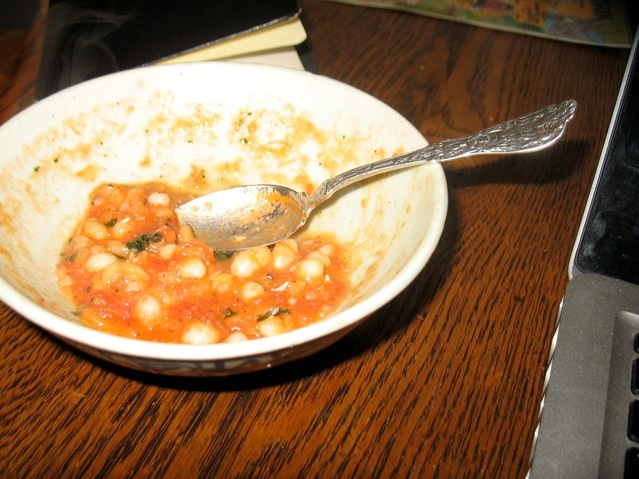 The taste is unbeatable; it’s simple to do once you’re in the habit; and if you cook large quantities at once and freeze them it’s as convenient as having canned beans on hand but with better flavor, less waste, less expense, etc. My routine, since I work from home, is to put several pounds of beans in a big bowl covered with water before I go to bed. The next morning I drain them, put them in a big pot with a couple of bay leaves, a chunk of onion and few peeled, whole garlic cloves and simmer them for 25-60 minutes depending on the bean. Small white ones like the navy beans in this picture tend to cook in about 25 minutes if they haven’t been sitting on a shelf for several years and chickpeas tend to take the longest, 45-55 minutes. When the beans are, salt them generously (like 2 teaspoons for 1 1/2 dry beans) tender turn off the heat and let the beans cool in their cooking liquid. 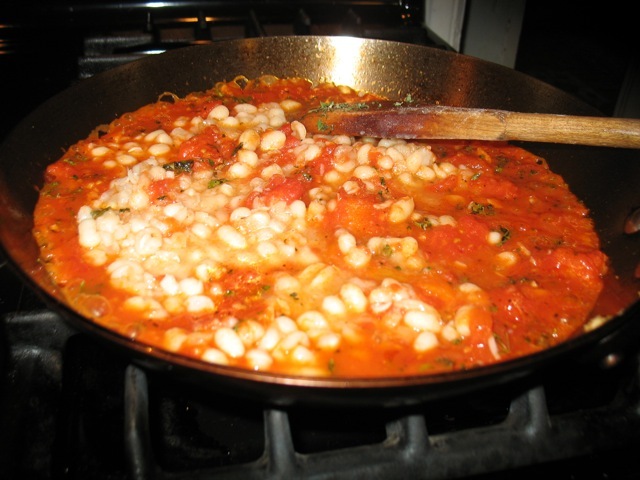 This will even out their texture as some beans inevitable will be a little firmer than others, and improve their flavor. They will not, as counterintuitive as it may seem, disintegrate from sitting in the hot liquid. For those of you who leave the house every day, you could put them to soak in the morning and then cook them while you’re making dinner. Once cooked, I strain them (reserving the liquid) and put them into pint and quart containers, pour the cooking liquid up to cover them (helps preserve them and it’s great liquid to keep if you’re going to make soup later on) and then freeze them. I do this with white, black and pinto beans and chickpeas regularly. Oh and on the perpetual question of when to salt the beans you’re cooking, I have long gone with the recommendation of John Willoughby from a piece in Gourmet years ago where he debunked the theory of not salting until they’re cooked. So, I salt at the beginning with great results but if you have a different method with which you are happy, by all means stick with that. So what to do with all those “bean popsicles,” as a student of mine once called them? 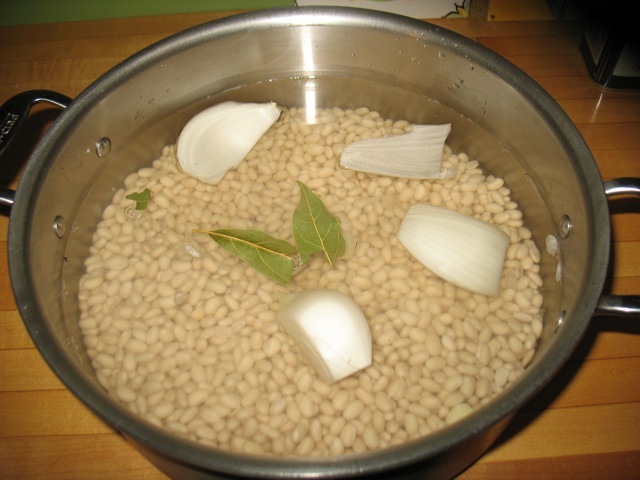 The frozen beans thaw quickly in a pan over high heat with a bit of water. I just thawed a pint for my lunch in about 5 minutes this way. Of course if you have the presence of mind to take them out of the freezer a few hours or a day ahead of time, great. They keep well in the fridge for the better part of a week. So, for the above lunch I mashed some garlic with salt, sautéed for a minute, added a can of tomatoes, broke those up a bit, added oregano and cooked over high heat for a about five minutes. I then added the thawed beans and heated those through. Some black pepper and a little olive oil to finish and voila! This makes a delicious light lunch or side dish mixed with pasta and maybe some sausage a hearty and quick dinner. 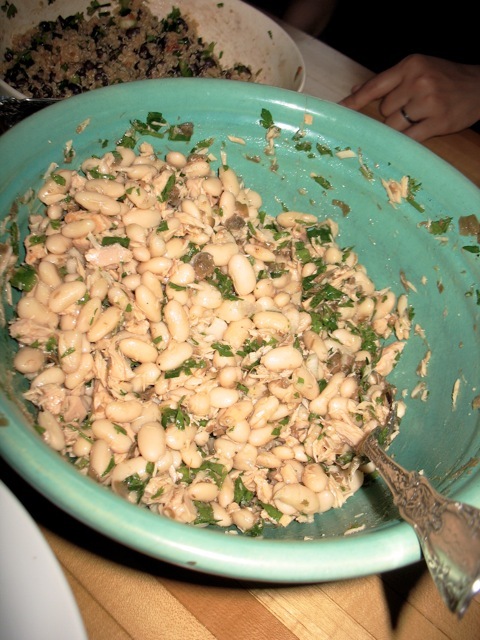 You could also toss the beans with some tuna, parsley, capers, finely chopped onion and a vinaigrette with plenty of red-wine vinegar and/or lemon juice. (For another local pitch, I love Oregon Albacore available at local grocery stores and farmers markets.) Or you could mash the beans with some lemon zest, juice, garlic, olive oil and a little rosemary or thyme and have a hearty spread. Or you could make a soup with kale, other veggies, sausage and white beans. The options really are vast. I’d love to hear from you on this subject. Do you cook beans? What do you do with them? Have you found it easy? Too much effort? Not satisfactory? Beans too mushy or crunchy? Happy bean cooking and thanks for reading! P.S. I’m going to be teaching a 3-part series in January on pantry stocking and cooking quick meals similar to the ones described above in case you’re interested.